1800s Dance Lessons this coming Saturday, December 8th in Fort Scott. There will be free lessons in the Grand Hall on the grounds of Fort Scott National Historic Site this Saturday from 10 a.m. until 1 p.m.
Come join us as we do some period dancing and perhaps even dance to a holiday song or two! If you have questions contact Dee Young at 913-269-1632. This is the Candlelight Weekend at Fort Scott NHS. Check out nps.gov/fosc for more information. 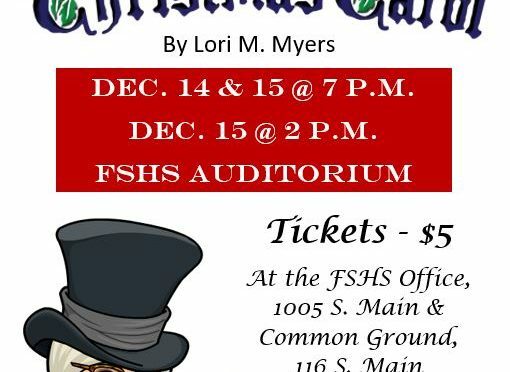 The Fort Scott High School Thespians present their holiday children’s theatre production of “A 21st Century Christmas Carol” by Lori M. Myers. Performances are at 7 p.m. on Dec. 14 and 15 and at 2 p.m. on Dec. 15 at the Fort Scott High School Auditorium. Doors open 30 minutes prior to show time and seating is limited. “A 21st Century Christmas Carol” is a new twist on a familiar tale. “Eleanor Scrooge, a greedy old spinster, spends her days barking orders at her gift shop employees. Though the mall will be closed, she still wants them to work on Christmas Day! Then she’s visited by the ghost of her old boss, Mr. Marley, and a parade of zany spirits who materialize from cheesy collectible figurines. … With great humor, contemporary references, and crazy characters, … audiences will fall in love with the classic story all over again,” according to Pioneer Drama Service. Characters in the production are played by area children in 1st-8th grades. Regen Wells, a 7th-grade student at Fort Scott Middle School, plays the lead character of Eleanor. Eighth graders Anna Laubenstein, Kinsley Davis and Kaitlyn Leavell play the Ghosts of Christmas Past, Present, and Future. All are also members of the FSMS Drama Club which meets weekly at the Middle School. The play is directed by FSHS senior Karina Kantilal and sophomore Ashanti Green. Music is led by freshman Christina Ramirez and sophomore Noah Martin with choreography from junior Mesa Jones and sophomore Avery Dorsey. About thirty other high school students are assisting with the direction and design of the show as a fundraiser for the State and International Thespian Festivals under the supervision of Thespian Director Angie Bin. 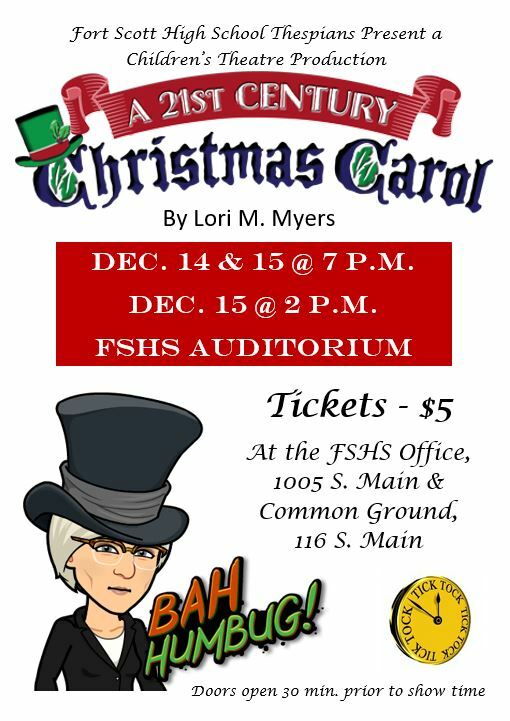 Tickets for “A 21st Century Christmas Carol” are $5 and available at the FSHS Office, 1005 S. Main; Common Ground, 116 S. Main; and at the door. 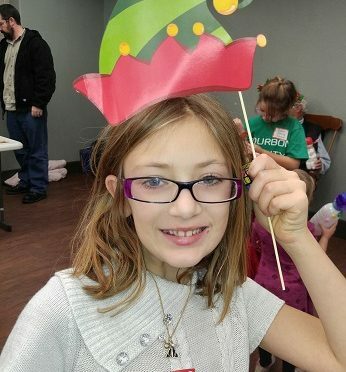 Fort Scott Public Library will hold its 4th Annual Family Holiday Party on Monday, December 17, at 4 p.m.
Activities for teens will be held upstairs, while games and crafts for children will be downstairs after group stories. Children and teens of all ages are welcome, but first grade and below must be accompanied by an adult at all times. The party will run from 4 – 5:30 p.m. and registration will open at 3:45. Enjoy holiday stories, songs, activities, snacks, crafts, and prizes, free. It’s a Trolley Ride that would put Ebenezer Scrooge in a holiday spirit! It’s the “NO HUMBUGS ALLOWED” Christmas Lights Tours on Dolly the Trolley. Tours are every Friday, Saturday, and Sunday evening now through December 23. 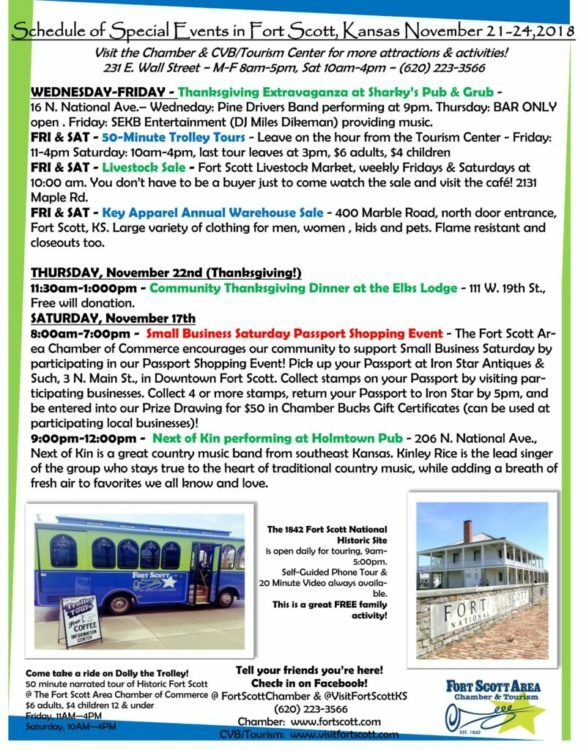 Tours depart from the Fort Scott Regional Tourism Center at 6:00 pm, 7:00 pm, and 8:00 pm each evening. Prior to the tour, enjoy a hot cup of cocoa and a tasty treat. 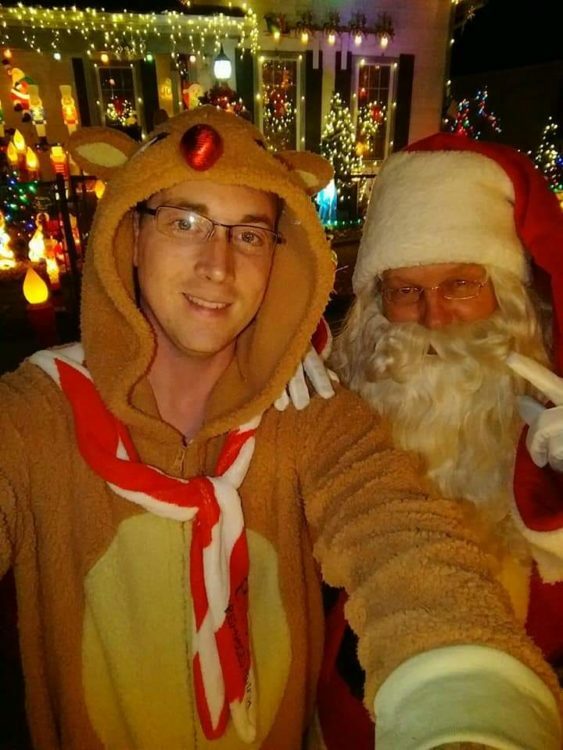 Adorn yourself with a glow necklace, and maybe have a chance to meet old Saint Nick himself. All tours will be chaperoned by the Thespians of Fort Scott High School, leading the tour in Christmas Carols and holiday humor. Tickets are $10.00 for adults, $8.00 for kids 12 and under and are on sale now at the Fort Scott Regional Tourism Center, 231 E. Wall, Fort Scott. Private tours ar also available for your group or organization. Find more information online at visitfortscott.com and click on the events tab, or call 620.670.2750. A float from the 2017 Fort Scott Christmas Parade. 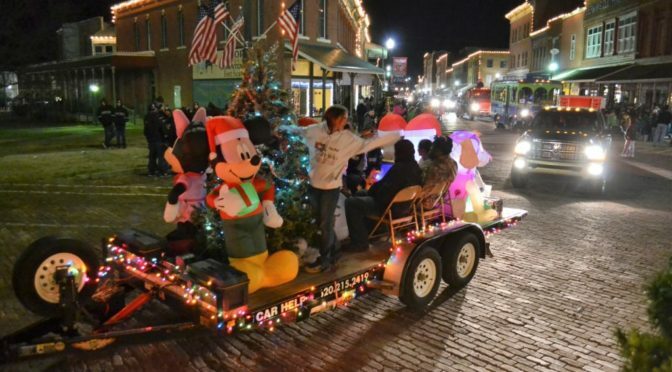 The Fort Scott Area Chamber of Commerce reminds our community that the annual holiday Christmas Parade and Tree Lighting will be held on Tuesday, December 4, 2018 in Downtown Fort Scott starting at 6pm. The deadline for participants to register a parade entry is this Monday, December 3rd at 1pm. The Chamber is calling all participants. There is no cost for businesses, schools and other organizations to register a float, golf cart, foot unit, band, horse unit, car or other entry into the parade. The parade entry form may be found on the Chamber website, www.fortscott.com, or may be picked up at the Chamber office at 231 E. Wall Street. The 2018 parade theme is “It’s a Cowboy Christmas!”. The parade route will take place on Main Street starting at 3rd Street, proceeding to Skubitz Plaza, then exiting northwest towards National Ave. 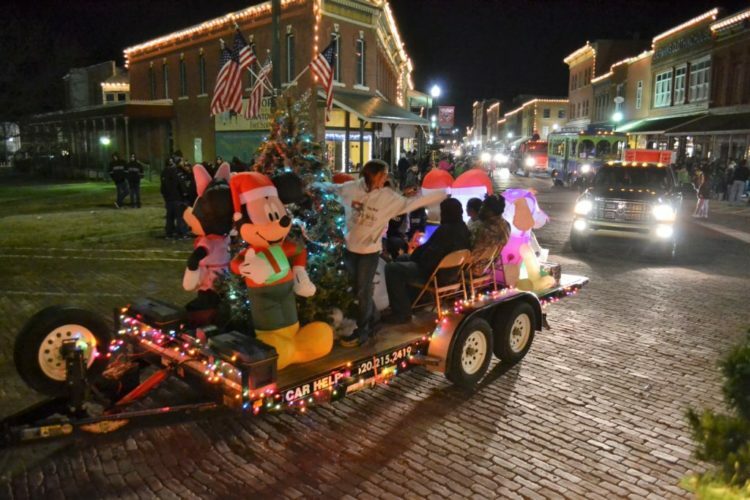 The Chamber encourages all to participate in the parade or attend as an onlooker to enjoy this magical night in Downtown Fort Scott. Contact the Chamber for more information at 620-223-3566. 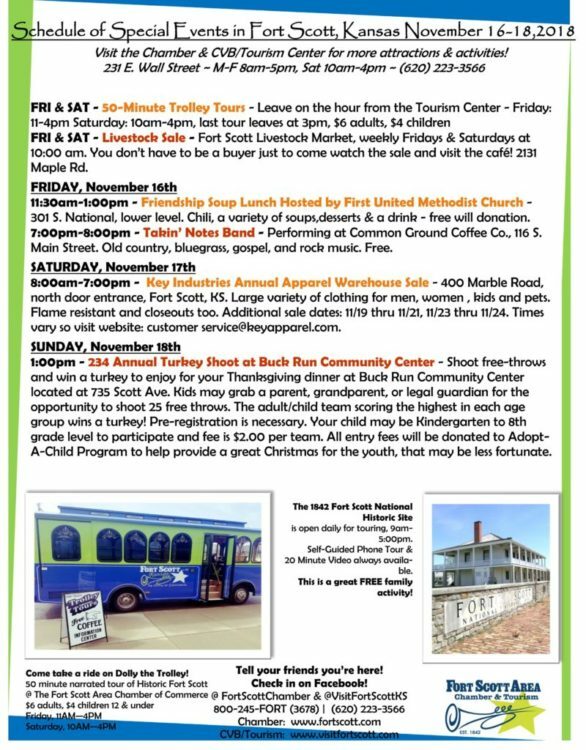 The Fort Scott Recreation Commission (FSRC) has several Christmas events planned for the community. 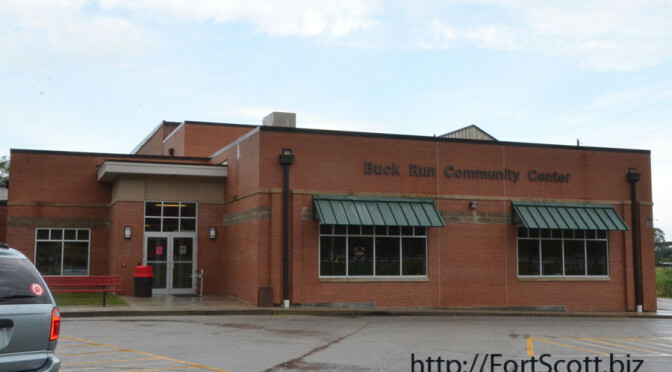 From Dec. 1-18 Buck Run Community Center (BRCC), 735 State St., will house a special mailbox that will allow letters to be sent directly to the North Pole. Letters need to have a return address so Santa can respond. The mailbox is located in the lobby of BRCC. This is a free program. 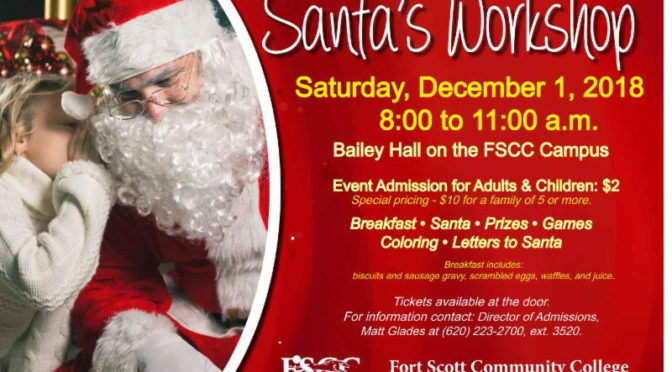 Also, beginning Dec. 1 the FSRC will take registrations for Mr. or Mrs. Santa Claus to call the boys and girls of Fort Scott to talk about their pets, siblings, chores, wish list and whether they have been naughty or nice. Call 223-0386 or stop by the BRCC. This is free. 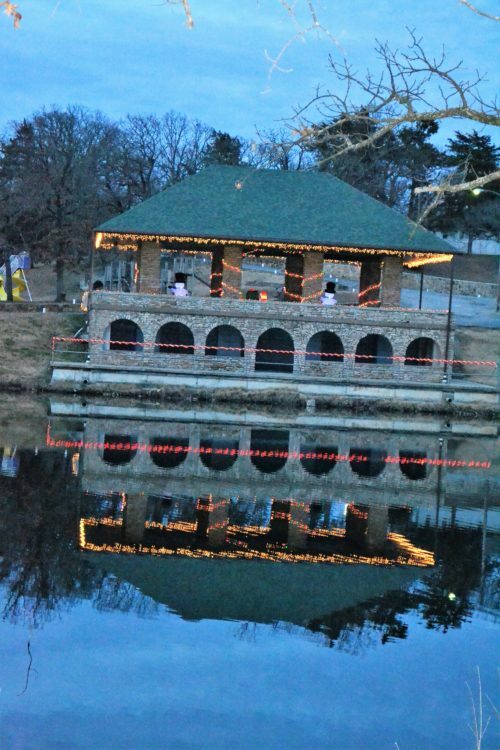 The City of Fort Scott is sponsoring Christmas in the Park on Dec. 1 at Gunn Park on Park Avenue, from 5-8 p.m. 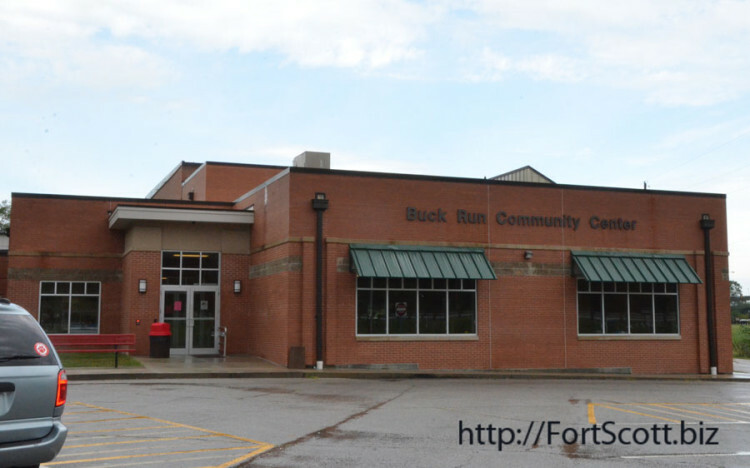 Event parking is at the old Newman Young Clinic and the Fort Scott Nursing Department parking lot on Burke Street. Visitors will be picked up and transported to the park. This free event features hot chocolate, decorating cookies, chili, visiting Santa, live music and a hayride. The big rock shelter house at Gunn Park is lit by Christmas lights as part of Christmas in the Park in 2017. Stop by to get free hot chocolate provided by the FSRC before you find a favorite spot for the Christmas parade on Main Street, on Tuesday, Dec. 4. They will be located in front of J & W Sports Shop, 20 N. Main Street. 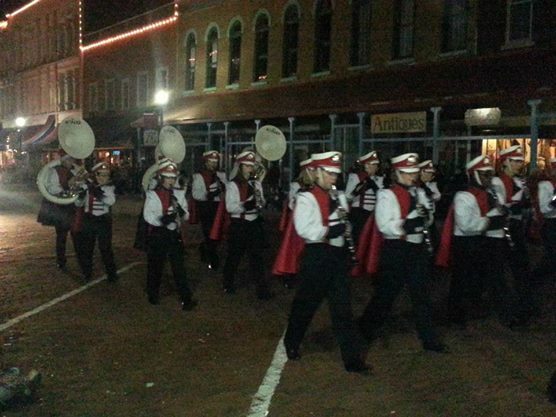 Band members march in this 2014 photo of the Fort Scott Christmas Parade. 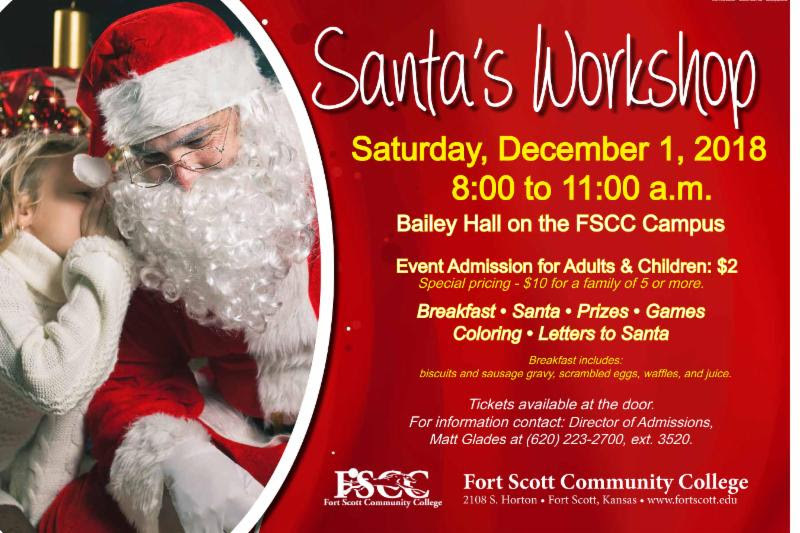 On Dec. 8 there will be a Santa’s Workshop at BRCC from 9 a.m. to 10:30 a.m. at BRCC. This is a craft program for pre-schoolers through 5th-grade children. Snacks and drinks are provided. Pre-register by Dec. 6 to allow for adequate supplies. A $1 registration fee will be charged for each participant. 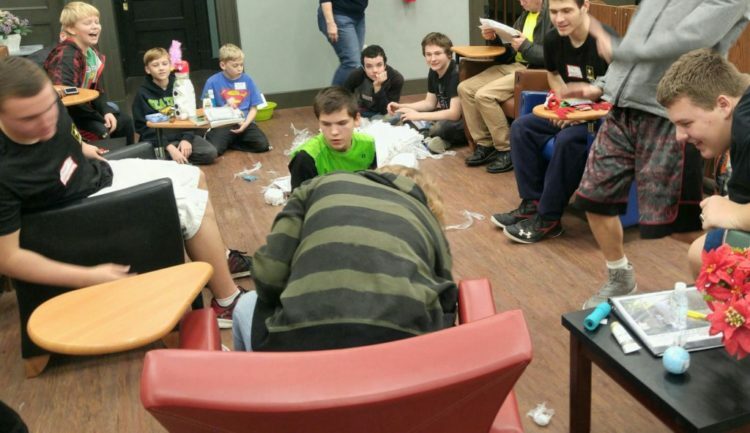 Fort Scott Middle School Pride helps with this event. On Saturday, Dec. 8, is the Secret Santa Rummage Sale from 8 a.m. to 2 p.m. at BRCC. All proceeds from the event benefits the Adopt-A-Family Program during the 2018 Christmas Season. To donate items for this sale, contact the staff at 223-0386 or bring to BRCC. The center is sponsoring a snow sculpture contest this winter, and the area has had many falls of snow recently to help with the creativity. Build a snowman, sculpture or another creation, get a photo developed and bring to the BRCC by March 15, when the contest ends. Prizes will be awarded the top three winners and individuals may enter as many times as they like. Pictures will be judged during the spring break. 8-11 am to meet the Jolly Old Saint Nick and enjoy a great time of breakfast, prizes, games, letters to Santa, coloring and much more! 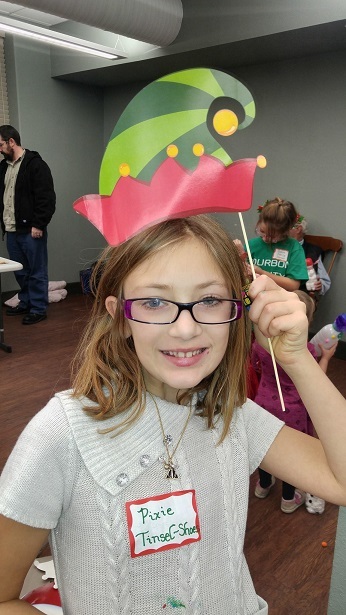 We encourage everyone to bring their children and have a wonderful jolly time at Santa’s Workshop!! 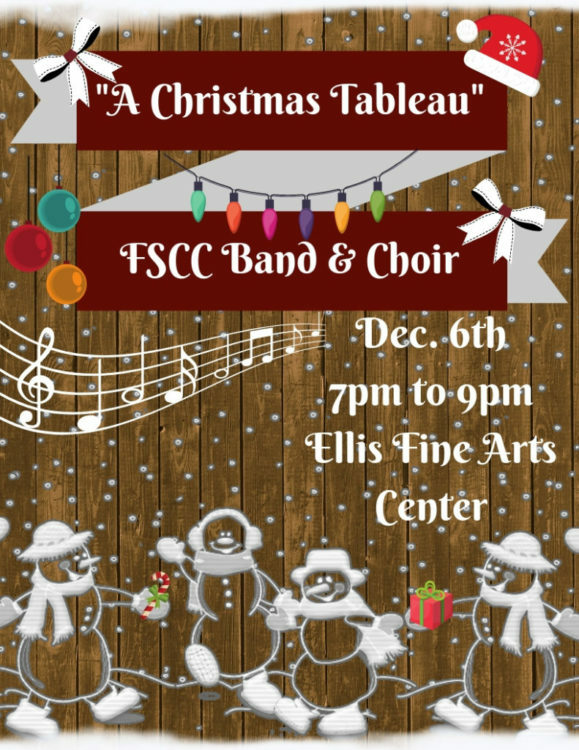 The free concert will take place on Thursday, December 6 at 7:00 pm in the Danny and Willa Ellis Family Fine Arts Center on the campus of Fort Scott Community College. 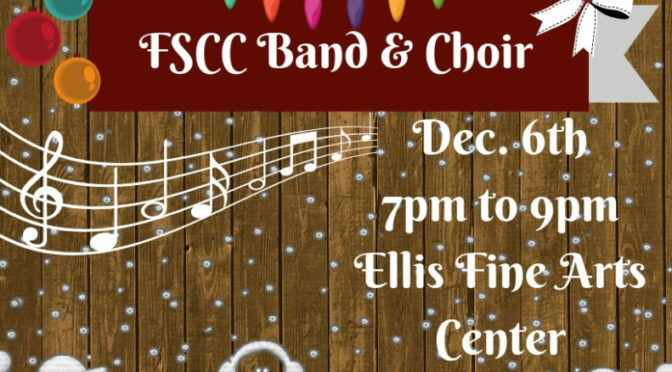 “This concert was very well received by the community last year, so we in the music department made it a priority to take it to the next level and provide the community with an even bigger concert this year,” said FSCC Music Director Seth Ernst. “This year’s concert will feature a wide array of musical styles including classical, jazz, pop, film score and contemporary choral.” Be sure to bring all of your family and friends and enjoy an evening of superb music that is sure to ignite your Christmas spirit! For concert information, contact Seth Ernst at 620-223-2700, ext. 3058. Rudolph is played by Tommy Johnson and Santa is played by Shannon Johnson. Courtesy photos. 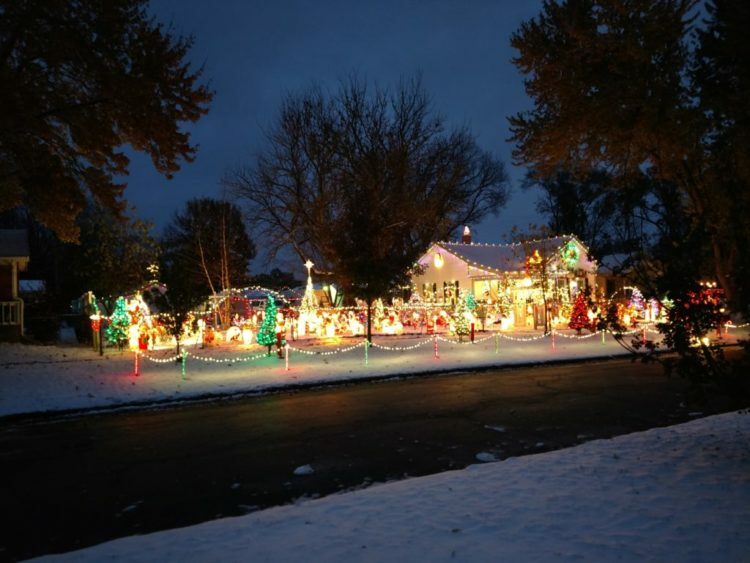 The lights from a local family’s Christmas display just might be able to be seen from space. The yard is loaded with lights and displays to entertain the community, and Santa will be there Dec. 8 for those who want a photo opportunity. 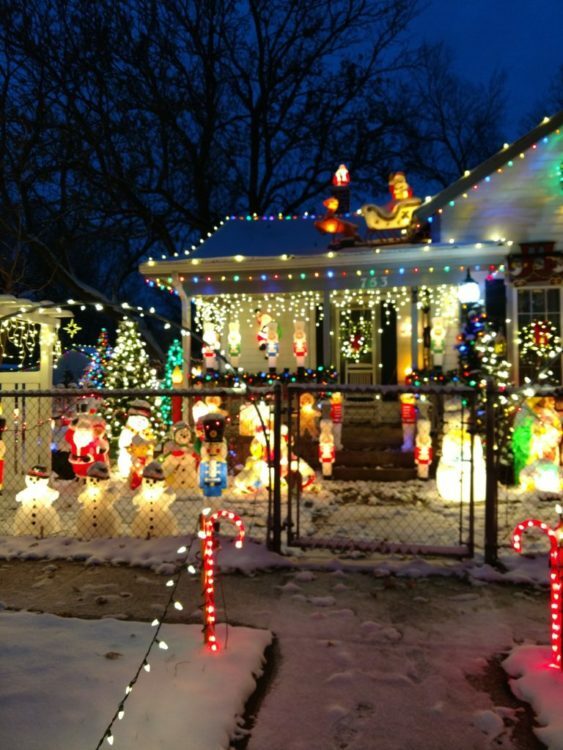 The home of Shannon and Tommy Johnson at 753 S. Clark has been transformed into a winter wonderland since 2009. The Johnson home is located east of Hwy. 69. Go east on Third Street, then turn south on Clark. “We light up every night from 5 p.m. to 9:30 or 10.00 p.m.” Shannon said. A free will donation will be accepted to help with costs and lighting for upcoming years, Shannon said. “We enjoy doing it for the community,” Shannon said. 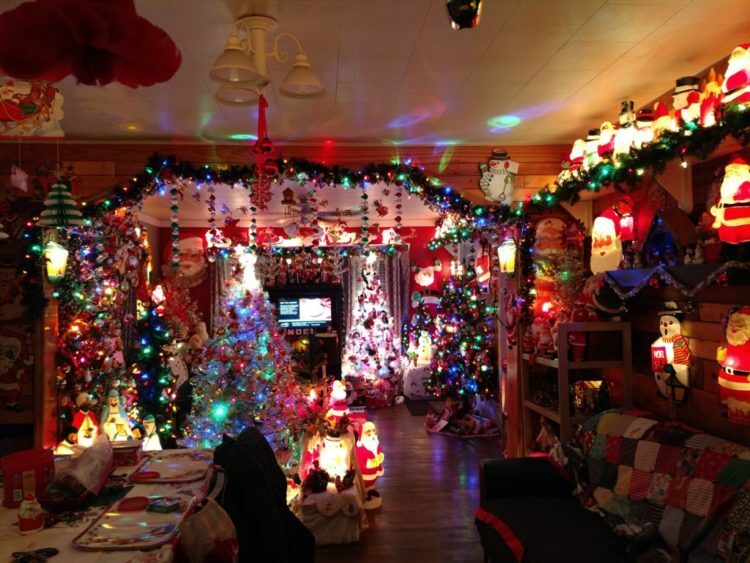 The Johnson’s also decorated their home for Halloween and had over 1,000 visitors, Shannon said. 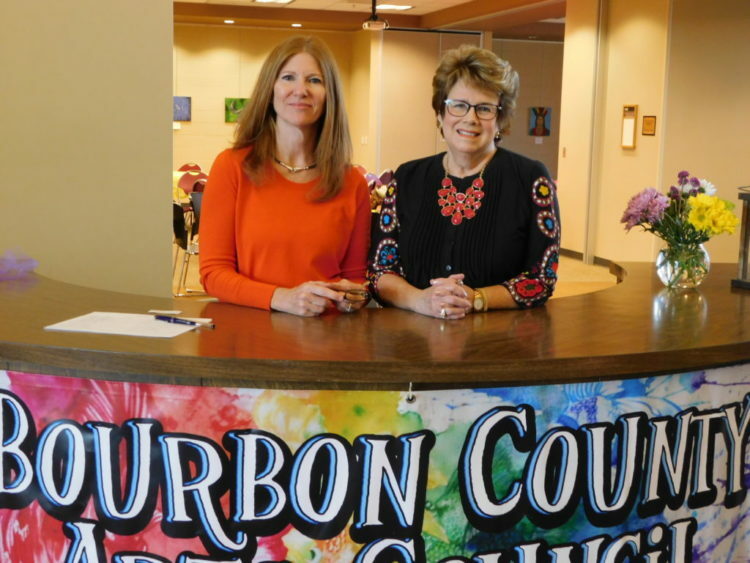 Bourbon County Arts Council members Deb Halsey and Elaine Buerge welcomed guests of the Chamber coffee Nov. 15. 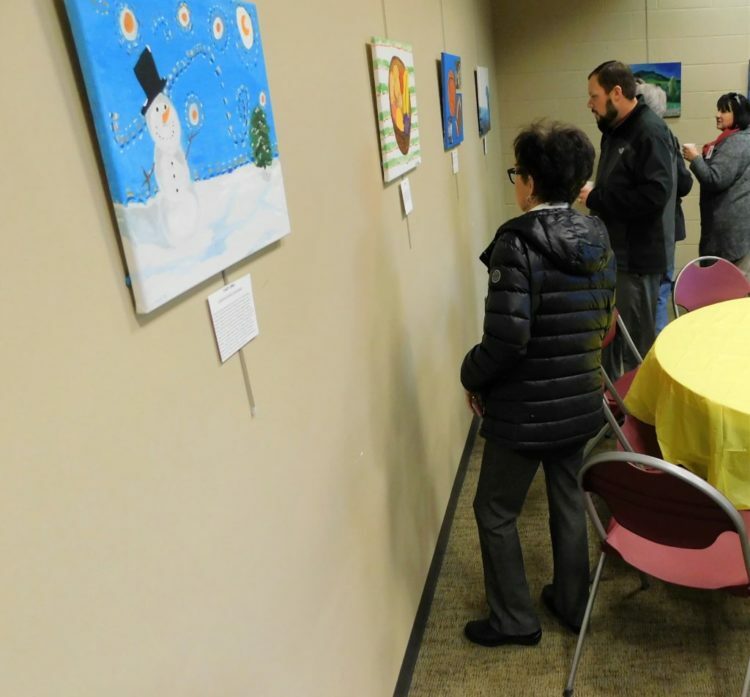 The Bad Art by Good People 2018 Art Exhibition was the feature of the Fort Scott Chamber of Commerce weekly coffee Nov. 15 at the Ellis Center. Deb Halsey, board member of the Bourbon County Arts Council told guests the auction is this evening (Nov. 15)at 7p.m. at the Ellis Center located on the campus of Fort Scott Community College. Marty Read will be the auctioneer. Chamber members look over the artwork Thursday morning. This year’s artists are Laura Agee, Karen Billiard, Susan Carillo, Rhonda Dunn, Bob Eckles, Lucy Gladbach, Kristin Gorman, Emily Hinkle, Jody Hoener, Rebekah Houses, Linda Jackson, Casey Lewis, Laura Meeks, Susan Messer, Bryan Ritter, Addi Smith, and Clyde Wendel. “There is a great variety of artwork,” Halsey said. The exhibit is open for viewing at 7 p.m. this evening for voting on a favorite piece of work. Appetizers are served. At 7:30 p.m. the auction starts. Kale Nelson looks at the artwork at Ellis Center. 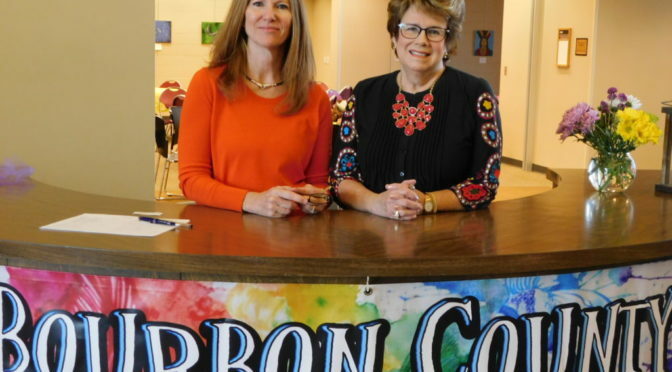 Some of the activities of the BCAC are providing scholarships for students pursuing art, Project Art at Fort Scott Middle School, the Gordon Parks Poetry Contest, musical concerts for the community and schools, Art Walks, and a summer patio concert series at Crooner’s Lounge. “Come out and vote on your favorite piece of art and help us to continue to promote the arts in our community,” Halsey said. 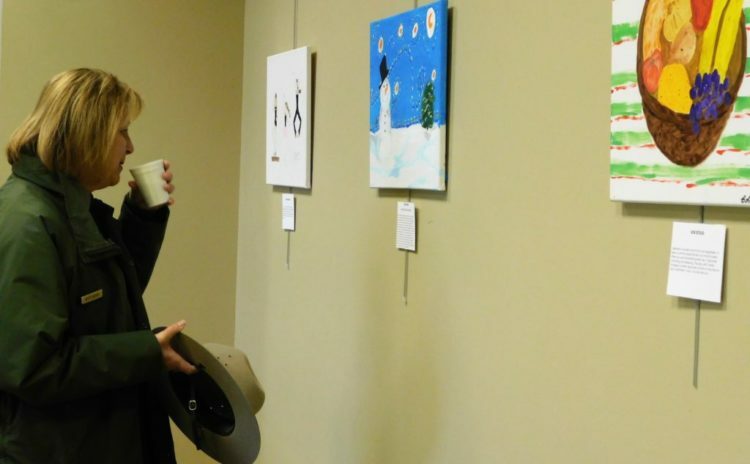 Betty Boyko drinks coffee while looking over the artwork. Bourbon County Arts Council Members are Deb Anderson, Tedene Tucker, Dan Magee, Ray Streets, Terri Floyd, Steve Floyd, Elaine Buerge, Rob Shaw, Laura Meeks, Breann Martin, Chris Woods, and Halsey.